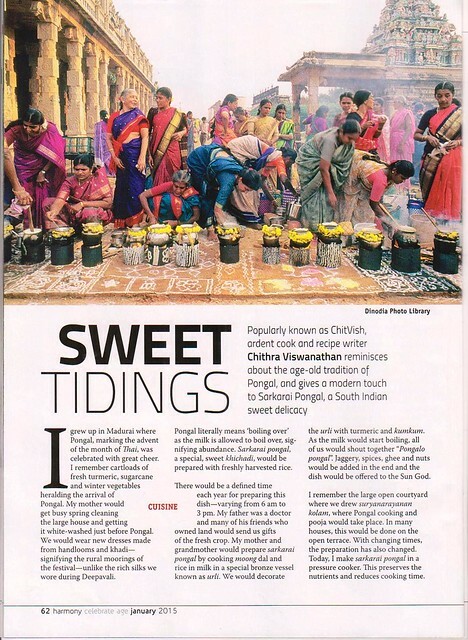 Chitvish says: “I grew up in Madurai where Pongal, marking the advent of the month of Thai, was celebrated with great cheer. I remember the cartloads of fresh turmeric, sugarcane and the winter vegetables – all heralding the arrival of Pongal. My mother would get busy with spring cleaning the large house and getting it white-washed just before Pongal. We would wear new dresses made from handlooms and khadi – signifying the rural moorings of the festival unlike the rich silks we wore during Deepavali. Pongal literally means “boiling over” as the milk is allowed to boil over, signifying abundance. Sarkarai Pongal, a special, sweet khichadi, would be prepared with freshly harvested rice. This three-day festival of Pongal begins with Bhogi when we would hang bunch of koorapoo herbs and avarampoo leaves at the entrance of the house to drive away all negative energies. On this first day, bonfires are lighted. The second day is the main festival when pongal would be prepared with freshly harvested rice. There would be a defined time each year for preparing this dish – varying from 6 am to 3 pm. My father was a doctor and many of his friends who owned land would send us gifts of the fresh crop. My mother and grandmother would prepare sarkarai pongal by cooking moong dhal and rice in milk in a special bronze vessel known as ‘urli’. We would decorate the urli with turmeric and kumkum. As the milk would start boiling, all of us would shout together “Pongal-o-pongal”. Jaggery, spices, ghee and nuts would be added in the end and the dish would be offered to sun god. I remember the large open courtyard where we drew suryanarayanan kolam, where Pongal cooking and pooja would take place. In many houses, this would be done on the open terrace. With changing times, the preparation has also changed. Today, I make sarkarai pongal in a pressure cooker. This preserves the nutrients and reduces cooking time. 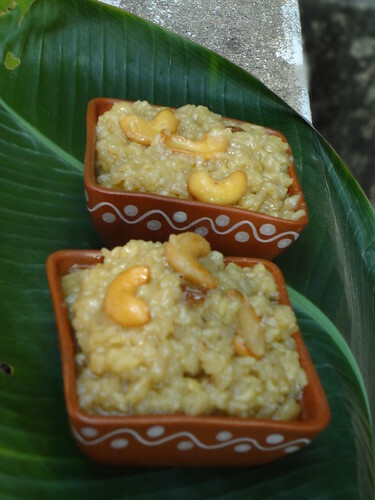 A special sweet khichadi prepared on Pongal festival. Chithraji makes it in a pressure cooker; thus preserving the nutrients as well as reducing the cooking time. Dry roast the moong dal for a few minutes and then soak with the rice for 15 minutes, wash and strain. In a pressure pressure cooker add water, milk, rice and dal. When the mixture starts boiling, close the cooker and put on the whistle. Immediately lower the flame and cook for 15 minutes. Place another pan on the stove with the powdered jaggery and half cup of water. Stir continuously until the jaggery dissolves. Strain and set aside. When the pressure has dropped from the cooker, remove the rice-dal mixture and mash it lightly. Add the jaggery liquid to this pongal mixture. Place it again on the flame, add 2 tbsp of ghee. Allow to cook. Mix well, add the spices and switch off the flame. In a small pan, heat 1 tbsp ghee, lightly roast the cashews and raisins and add as a garnish to the sweet pongal. P.S: There may be some edits in this article when published in the magazine. Festivities remind us with so much of emotions. Emotions of action – Flying kites / movies , emotions of bonding – spending time with family, emotions of laughter – as what silly things you did last festivities – which friends don’t let you forget. Emotion of splendor – expressed in the way you dress. And THE MOST IMPORTANT EMOTION OF TASTE BUDS— WE WAIT FOR FESTIVITIES TO HAVE THE SEASONS DELICACY – and Sweet Pongal is the one! Thanks for the post. This morning I entered the kitchen without any thoughts . Looking at the post of “sarkarai pongal”, couldn’t resist to make it as it was the perfect day to try it. My maid walked in with a shock as how did I make this as it was her duty last few years. She pinched my checks with affection after tasting it n said “yapadi MA ni sainje” which means how did u make it? This taste better than what I can make. ” Thank u PJ for ur post n guidance.